I also unveiled the monster Canadian discount brokerage comparison earlier this week. I swear I could have written another book in the time it took me to assemble that post. 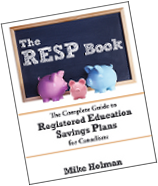 Don’t forget there is an RESP Book giveaway ending soon at MapleMoney. My friend Jason from Frugal Dad, wrote this excellent post about momentos and memories called Giving away stuff: things come and go, but memories last forever. Jason has lost his mom and both grandparents over the last couple of years, so he knows something about memories. Toronto elected a new mayor who doesn’t impress everyone. Although I agree with Ford that fiscal restraint is sorely needed, I wish it didn’t have to come in the form of a drunken Matt Foley. I recently discovered this National Post writer, Kelly MacParland who is incredibly funny. Unfortunately it appears she mainly writes about politics, but still worth a read. Oblivious Investor had a great article called investing requires guessing. Unfortunately, most people just want to hear black and white answers. Canadian Couch Potato introduces the MoneySense guide to retiring wealthy. Canadian Capitalist discovered how to save currency exchange fees on US$ dividends. My Own Advisor says ETFs are effortless. Preet Banerjee revisits the variable-rate vs fixed mortgage debate. Canadian Personal Finance wonders why would anyone want to bank on Sunday? Larry MacDonald notes that the hysteria over rare earth is overblown. Michael James on Money says he’s not investing in China. The Financial Blogger explains what M-35 is all about. What I’d like to know is how he came up with the name? Thanks for the mention, hope to get to your book very soon! Thanks for the mention Mike! Congratulations on having part of your book in the Globe and Mail. Thanks for the mention. Impressive output lately! First the RESP Book and now the brokerage survey. Wish I could find the time and energy. Thanks for the mention Mike. Have a great weekend! Congrats on your book and the G&M feature. I wish you continued success. Great stuff. For the record; M-35 is for Millionaire at 35… 6 years to go!